Get printed materials that meet your needs and standards. Take advantage of the professional printing, copying, and binding services offered at InstaCopy Printing & Graphics, Inc. Regardless of your requirements, you can trust our team to ensure your complete satisfaction. Based in Toledo, OH, we serve commercial clients in Northeast Ohio and Southeast Michigan. Additionally, we work with a limited number of residential customers. We are a full-service union print and copy bureau designed to supply a wide variety of products and services to companies, organizations, and individuals throughout Northwest Ohio and Southeast Michigan. We began in 1972 in East Toledo as a one-man print shop. Over the years, we grew larger and found an even larger facility in Toledo, OH. This latest move has allowed us the space to acquire more equipment and capability. Now, we can print as well as copy. Our mission is to supply all of the printing, copying, binding, and finishing services that a business needs in the course of their daily operation. Why Choose InstaCopy Printing & Graphics, Inc? We are large enough to meet your demands but small enough to care! With our low overhead and state-of-the-art equipment, we are able to provide you with quality workmanship, superior turnaround times, and fair pricing. At InstaCopy Printing & Graphics, Inc, complete printing services are within your reach. We can print business cards, manuals, cookbooks, contract agreements, flyers, menus, invitations, and much more! We can duplicate printed materials in black and white, as well as in 1 color, 2 colors, or full color! For your convenience, we accept hard copies, files on a disk, or documents via the internet. We are a member of the Sylvania Area Chamber of Commerce and the Toledo Typographical Union, Local No. 63. In addition, we are licensed, bonded, and insured. 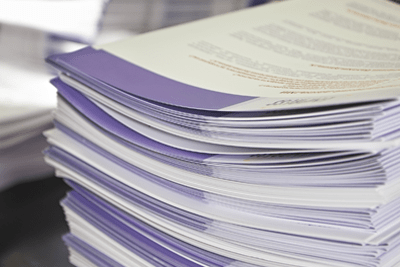 Whether you require contract printing services or high-volume copying solutions, we have you covered. Simply reach out to us today to discuss your needs with our staff. Our printing company is open from Mondays to Fridays. We serve clients in Northeast Ohio and Southeast Michigan.